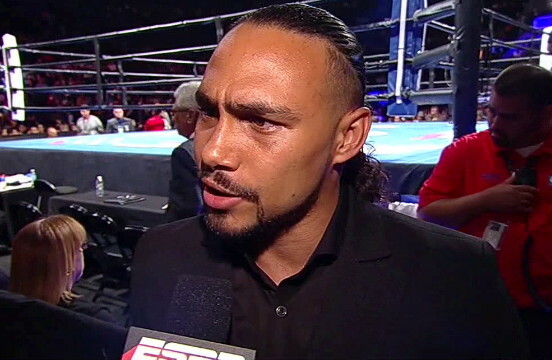 By Dan Ambrose: WBA “regular” welterweight champion Keith Thurman (26-0, 22 KOs) said last Saturday night that he’s waiting and hoping to get a fight against WBA/WBC welterweight champion Floyd Mayweather Jr. (48-0, 26 KOs). Thurman believes he’s got the talent to beat the 38-year-old Mayweather, and he just wants a shot at fighting him. Thurman thinks that Mayweather should answer the question of whether or not he wants to face him inside the ring because he’s ready to take the fight with him whenever he offers it to him. Thurman thinks he’s got the talent to defeat Mayweather when the time comes for the two of them to face each other. I don’t believe Thurman has anywhere near the same kind of talent that Mayweather has going for him. You could tell from the interview that Thurman is starting to get annoyed that Mayweather isn’t showing any interest in fighting him before he retires from the sport. Thurman really wants that fight before Mayweather walks away and retires. The payday that Thurman would get from the Mayweather fight would be huge. It would set Thurman up for life, and it wouldn’t matter if he were exposed by other fighters afterwards like Errol Spence Jr., Danny Garcia, Shawn Porter, Kell Brook or Adrien Broner. However, Mayweather isn’t obligated to fight an inexperienced fighter like Thurman. Mayweather might have wanted to throw Thurman a bone if he’d been taking the type of fights to build up his career and make himself a bigger name. but unfortunately Thurman has been facing largely weak opposition since he turned pro, and he still hasn’t cut his teeth against his first quality opponent. Thurman says that he’s going to be speaking with his adviser Al Haymon soon to have him line up a big fight before the end of the year. Thurman, 26, still hasn’t faced anyone that you can call a good fighter, but he says he’s willing to fight guys like Mayweather, Danny Garcia, Amir Khan, Marcos Maidana or Shawn Porter. Whether Thurman is really willing to take those fights is up for debate. What we do know is he’s being matched in pretty the same way that Amir Khan and Danny Garcia are being matched. In other words, Thurman is being carefully matched against beatable guys instead of dangerous fighters that might beat him. What’s interesting is that when Thurman was recently offered a fight against unbeaten Errol Spence Jr. on Mayweather’s September 12th undercard, Thurman turned down the fight. It would have easily been the toughest fight of Thurman’s pro career, and yet he turned it down cold. What does that tell you? It’s doubtful that Danny Garcia and Thurman will fight. Thurman says he’s interested in the Garcia fight, but he’s not the one who makes his fights. The match-making is done by his adviser Al Haymon, and I don’t think he’s going to put Garcia in with him. Haymon will likely keep Thurman and Garcia in separate lanes and save Garcia up for later to swoop in on one of Mayweather’s two welterweight titles when he vacates them in 2016 when he walks away from the sport. As for whether he would like to fight Floyd Mayweather Jr., Thurman said “The real question is what is the chances of Keith Thurman getting a shot at Floyd Mayweather? To truly answer that you have to put a mic close to Floyd Mayweather, and get the world from him. It’s obvious that I’m willing to fight the champ. I have the desire to fight the champ, and I believe I have the skills and the talent to beat the champ. So we’ll see what happens with Mayweather further on in his career,” Thurman said. Thurman really needs to upgrade his opposition before he starts talking about Mayweather. Thurman should have said yes to the Errol Spence Jr. fight because that would have given him a good chance to prove himself.